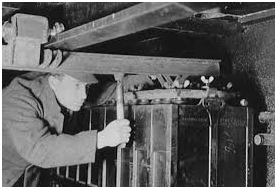 Lead acid batteries were invented in 1859 by Gaston Planté and first demonstrated to the French Academy of Sciences in 1860. Even after so many years since its invention, improvements are still being made to the lead acid battery and despite its shortcomings and the competition from newer cell chemistries; the lead acid battery still retains the lion’s share of the high power battery market. In 1975 First National Battery entered the industrial field to strengthen the company’s position in the market. The new industrial division at the East London factory established the company as a South African owned and controlled manufacturer of both Automotive and Industrial Batteries. A lead acid battery stores electrical power in chemical form, and consists of two or more cells. Each cell comprises two different compounds of lead, immersed in diluted sulphuric acid. In its fully charged state, the active material of the positive plate is lead dioxide, and that of the negative plate, porous or spongy lead. A lead acid battery is a “secondary battery” which means it can be discharged and recharged a number of times before reaching the end of its life. The mining batteries are warranted to operate for a certain number of cycles. This is because the chemical reaction which takes place in a lead acid battery is reversible. (Primary batteries, such as zinc/manganese dioxide batteries widely used in torches, radios etc. cannot be recharged and have to be discarded once discharged). 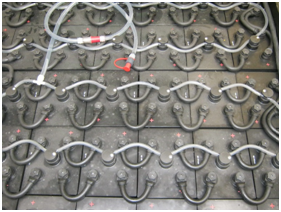 A mining battery, also known as a traction battery, comprises of a number of 2V individual cells that are connected in series by means of copper cable connectors to form a certain voltage to give power to the required application. 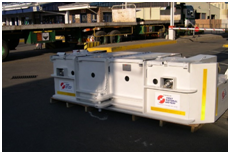 First National Battery’s traction batteries comply with DIN specifications, meaning our locomotive batteries can be used in many international markets. First National Battery has a network of branches strategically placed near all major mining operations and this allows for speedy response to customer requests. 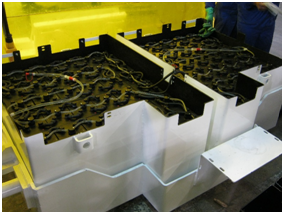 First National Battery’s mining batteries are available in a range of different amp hour capacities and dimensions. 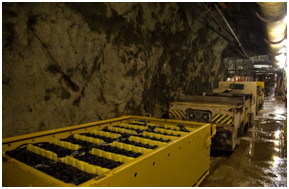 First National Battery mining batteries are used in a number of different applications including mining locomotives, drill rig machines, scoop batteries and hauler batteries. 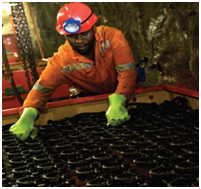 Furthermore, the First National Battery mining batteries are exported to mining companies throughout Africa and used extensively in their mining operations. First National Battery offers an optional battery filling system which assists users in ensuring all battery cells are filled to the correct levels. All First National Battery mining batteries are fully maintainable by the end user, reducing downtime and cost of ownership. 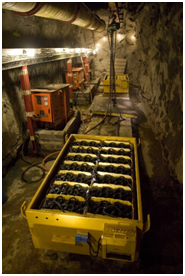 We supply free training to battery bay attendants and maintenance personnel on the complete range of mining batteries. Audits are done by customer request. First National Battery’s Training Department aims to provide quality training to equip trainees with the relevant skills to effectively contribute to the economic development of an organisation, and maintain equipment according to industry/DMR/OEM standards. The main objective is to increase the knowledge of maintenance staff and assistants, by combining theory and practice to improve your employees’ core, industry-specific, and job-specific competencies. In turn, this allows for a multi-skilled workforce, enhanced operational efficiency and improved profitability. We are confident that once your staff have been trained correctly and put the skills they’ve learnt into practice, you will see a considerable improvement in production time and turnover of equipment. Our full-time training staff are equipped with in-the-field knowledge and experience at your service. Our training is of the highest standard, and includes pre and post training evaluations to determine the trainees’ grasp of the knowledge. Upon successfully completing the training, each attendee is awarded a certificate of completion. An annual audit is advised at the very least, but this can be done quarterly if required. Please contact your nearest office or sales representative should you require more information.